Household micro-data reveal striking differences in secured debt holdings across Eurozone countries. This column presents new evidence on the role of household characteristics and country institutions in accounting for the cross-country patterns observed. In countries with lengthier asset repossession periods, young or low-income households face higher borrowing costs, leading to a lower probability of holding mortgages. The Household Finance and Consumption Survey micro-data reveal striking differences in secured debt holdings and the cost of collateralised debt across Eurozone countries. 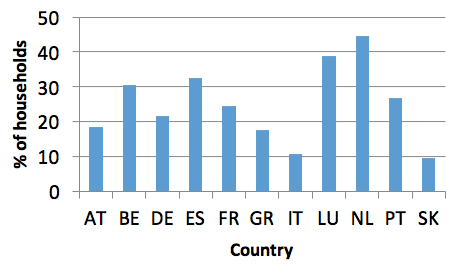 For example, nearly half of Dutch households hold secured debt, while only one in ten Italian households do (Figure 1). 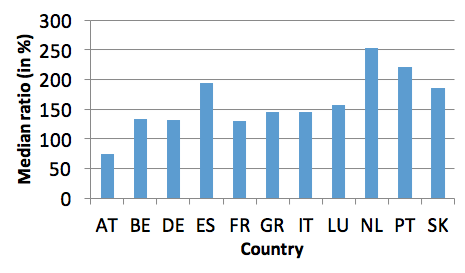 Furthermore, among households with secured debt, debt-to-income ratios are three times smaller in Austria than in the Netherlands (Figure 2). While the relevance of the level and distribution of household debt for aggregate consumption has been documented in academic and policy work, there is little agreement on what accounts for the strong cross-country differences in mortgage outcomes (see Badarinza et al. 2015). The heterogeneous distribution of debt outcomes could be due to cross-country differences in household characteristics that determine borrowing, such as the age of the borrower, for example. In 8% of Italian households, the eldest person is below 35 years of age, while in the Netherlands that fraction is twice as large. Since younger households tend to borrow more often than older households, differences in the cross-country age distributions may account for the divergent patterns in the fraction of households with outstanding debt. Alternatively, the divergence could be due to cross-country differences in institutions, such as the length of time it takes to repossess an asset in case of non-payment or in the taxation of mortgage payments (see Figures 3 and 4.) A lengthier period to repossess an asset in case of non-payment may lead banks to screen borrowers more extensively, causing similar households to face different mortgage costs and thus a different propensity to borrow. In this column, we use the harmonised household-level data in the Household Finance and Consumption Survey to present new evidence on the role of household characteristics and country institutions in accounting for the cross-country patterns observed (see Bover et al. 2016). There is a hump-shaped profile of secured debt holding over age-cohort groups, where the propensity to hold secured debt generally increases up to the ages of 35-44 years, and decreases thereafter. 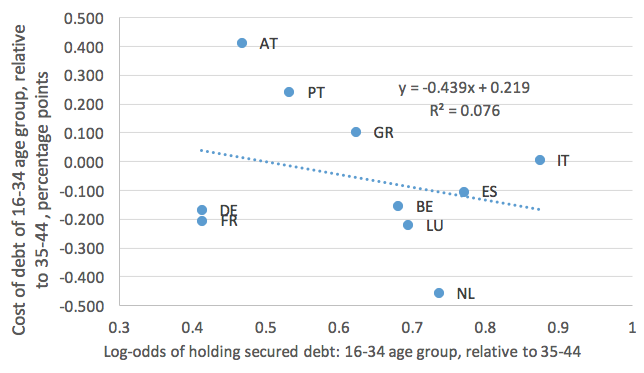 However, the extent to which the probability of holding debt varies across age groups is different across countries. In Portugal or Austria, households with a head below 35 years have a much lower probability of holding debt than prime-age households between 35 and 44 years. On the other hand, in countries like the Netherlands or Belgium, young households and prime-age households between 35 and 44 years have a very similar propensity to borrow. In addition, indebted younger households tend to pay higher interest rates on secured debt holdings in a number of countries. In Portugal or Austria, for example, indebted households below 35 years pay for their mortgages at interest rates at least 20 basis points more than prime-aged households, while younger households pay lower interest rates than prime age households in Belgium or the Netherlands. 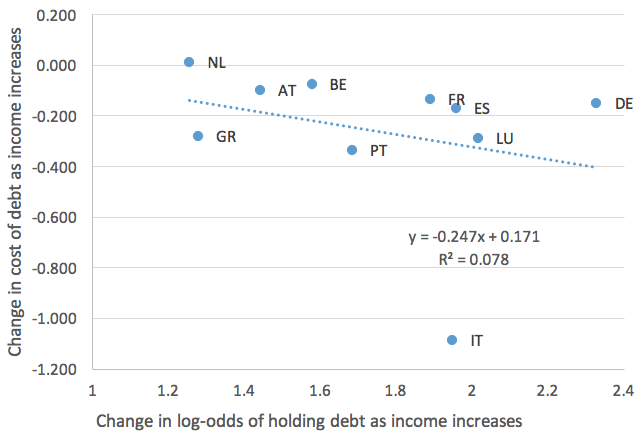 Regarding the degree of indebtedness across income groups, in most Eurozone countries the propensity to hold secured debt increases with income. However, that propensity is again markedly different across countries. The probability of holding a mortgage increases with income much more strongly in Germany, Italy or Luxembourg than in the Netherlands or in Belgium. On the other hand, mortgage interest rates fall smoothly along the income distribution. This is consistent with the hypothesis that banks price in a relatively higher expected probability of default among low income and younger households by increasing borrowing costs. 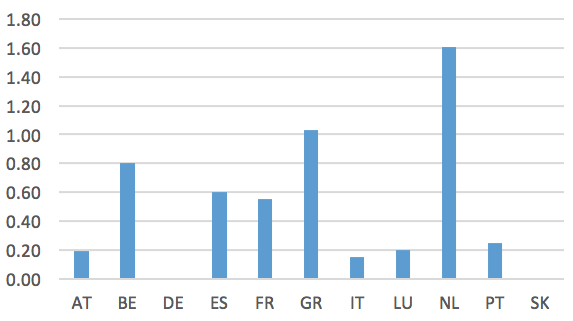 Again, there are differences across countries –indebted Italian or Luxembourgish households in the top decile of the income distribution pay 200 and 55 basis points lower interest rate, respectively, than indebted households at the bottom decile, but those differences are negligible in Belgium or the Netherlands. Summarising, despite the general finding that age and income variables correlate with debt holdings within countries, there are substantial cross-country differences in the impact of these variables on secured debt outcomes. Those findings suggest that there are country-specific factors – above and beyond compositional effects – that play a role in shaping the distribution of mortgage debt. A number of recent studies stress the role of country-level institutions in shaping the distribution of debt outcomes across countries and demographic groups. Jappelli et al. (2005) and Djankov et al. (2007), for example, highlight the impact of the length of time it takes a bank to repossess an asset in the event of loan default on private sector debt ratios. Intuitively, a longer repossession period increases the cost of a lender’s asset recovery process in the event that a borrower does not repay a mortgage. We may expect, therefore, that longer repossession periods make access to loans especially tight and more expensive for groups who, from the perspective of lenders, have higher ex ante chances of not repaying their loans. Empirically, these are typically low-income individuals or younger households who have had less time to accumulate assets over the life cycle (Duygan and Grant 2009). A higher cost of debt is likely to result in a lower probability of borrowing among youths or low-income households. To assess which institutions account for the differences in the distribution of debt, it is useful to plot the relative probability of having a mortgage among different age and income groups against the relative cost those groups pay for their mortgages. In Austria or Portugal, indebted households below 35 years pay higher interest rates than households between 35 and 44 years. In Austria or Portugal, households below 34 years are also less likely to hold mortgages than those in the 35-44 age bracket. Conversely, in the Netherlands or Belgium, indebted households below 35 years pay lower interest rates for their mortgages than older households while the chances of having a mortgage do not depend much on age. More generally, as suggested by Figure 5, in countries where indebted youths pay relatively higher interest rates on their mortgages, they are also less likely to hold debt. Note: Values around 1 indicate small differences between both groups, while values around 0 mean that the 16-34 has a lower probability of holding debt than the 35-44 group. One can also compare the relative cost of mortgages paid by low-income households to their relative chances of holding a mortgage. Figure 6 suggests that in countries where indebted low-income households pay higher interest rates for their mortgages, they also have a lower probability of holding a mortgage (consider the cases of Italy and Luxembourg at the south east of the lower panel). Conversely, in countries where low- and high-income households pay similar interest rates, they also have similar propensities to borrow (consider the cases of Netherlands and Belgium at the north west of the lower panel). Overall, the relationship between the cost of debt faced by low-income households and their propensity to borrow is negative. Note: Higher (lower) values indicate that the probability of holding debt is more (less) sensitive to household income. The patterns shown in Figures 5 and 6 are in accord with the prediction that countries with lengthier asset repossession periods, youths or low-income households face higher borrowing costs, leading to a lower probability of holding mortgages. Consider the cases of Portugal and the Netherlands in Figure 5. Portugal has a relatively long time to repossess (around 20 months), while repossessions in the Netherlands take about 4 months. In the country with a longer repossession period (Portugal), young households pay higher interest rates and are less likely to hold debt than prime-age groups, while those differences are much less prominent in the Netherlands. Consider the alternative hypothesis that differences in the taxation of mortgage payments account for the distribution of debt across countries and households (see Andrews et al. 2011). Tax incentives generate a higher incentive to borrow for young individuals, and lending institutions with market power may partially benefit from the subsidy by charging higher interest rates to indebted young households.2 If tax incentives explained differences in borrowing outcomes, we would expect that in countries where youths are more likely to borrow, they would also face higher mortgage interest rates. That is contrary to what Figure 5 suggests. In our paper, we test formally if the length of asset repossession periods, the taxation of mortgage payments or the regulatory loan-to-value ratios explain the distribution of debt outcomes (Bover et al. 2016). In keeping with our informal discussion here, we find that the length of the time it takes a bank to repossess an asset in the case of non-payment correlates most closely with the debt patterns observed. Our results suggest that legal processes that delay the recovery of collateral in the case of non-repayment affect the supply of secured credit. In particular, banks react to expected losses due to longer repossession periods by pricing secured debt differently across age and income groups and charging relatively higher interest rates to young and low-income households. Authors’ note: The views expressed herein are those of the authors and should not be attributed to the respective central banks or the ECB. Andrews, D, and A Caldera Sánchez (2011), “The evolution of homeownership rates in selected OECD countries: demographic and public policy influences”, OECD Journal: Economic Studies, OECD Publishing, Vol. 2011(1), 1-37. Badarinza, C, J Cochrane, and T Ramadorai (2015), “International Comparative Household Finance”, Working Paper, Harvard University. 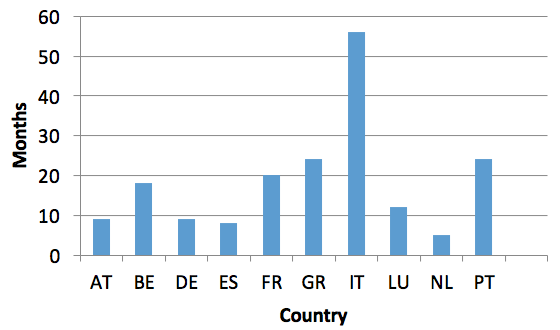 Bover, O, J M Casado, S Costa, P Du Caju, Y McCarthy, E Sierminska, P Tzamourani, E Villanueva, and T Zavadil (2016), “The Distribution of Debt Across Euro Area Countries: The Role of Individual Characteristics, Institutions and Credit Conditions”, International Journal of Central Banking, June. Devereux, M, and G Lanot (2003), “Measuring tax incidence: an application to mortgage provision in the UK”, Journal of Public Economics 87(7–8), 1747–1778. Djankov, S, C McLiesh, and A Shleifer (2007), “Private credit in 129 countries”, Journal of Financial Economics 84 (2), 299-329. Duygan, B, and C Grant (2009), “Household debt repayment behaviour: What role do institutions play?”, Economic Policy 24 (57), 107-140. Gervais, M (2002), “Housing taxation and capital accumulation”, Journal of Monetary Economics 49, 1461–1489. Jappelli, T, M Pagano and M Bianco (2005), “Courts and banks: effects of judicial enforcement on credit markets”, Journal of Money, Credit, and Banking 37(2), 223-244. In Bover et al. (2016), we also analyse the amount borrowed, conditional on borrowing, omitted here to save space. Similarly, all the results we discuss hold constant a number of socio-demographic factors, like the distribution of schooling within the household, the labour market status of core household members, and household size. Gervais (2002) shows that the deductibility of mortgage payments generates an excess return of housing over financial investments, and that young households, who have a longer horizon to benefit from excess returns, benefit disproportionally from the incentive. Devereux and Lanot (2003) document the pass-through of group-specific mortgage subsidies into higher lending interest rates in the United Kingdom.